If you’re anything like me, I bet you’ve said the following statement dozens of times in your life. If I knew then what I know now… I’d be a killer chess player in Canada. Okay, so maybe the last half of your sentence might be a little different, but you get the point. The idea is that you’d have extra knowledge to do more than you would otherwise have done. 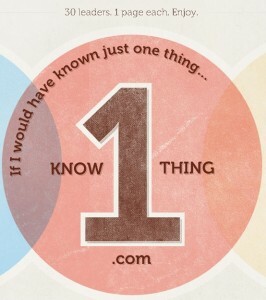 Today I have a free eBook titled “If I Would Have Known Just One Thing” to share with you on that very topic. Shane Mac asked me to give him a hand, and he’s just too awesome to turn down. This entry was posted in General and tagged Career Advice, eBook, Free Resources, Shane Mac on August 19, 2010 by Ben.